The 2013 Pierce Dash CF PUC (Pierce Ultimate Configuration) has a Cummins ISL9 450 horsepower engine with a Jake Brake. The unit has an Allison GENIV 3000 Transmission. The fire pump is a single stage 1250 GPM. The unit carries 500 gallons of water. It has an extended front bumper that carries 150 foot of 1 3/4 inch hose that is classified as a "trash line" for dumpster and trash fires. It has two jiffies above the fire pump and each jiffy is in a plastic slide out tray that is pulled out to reload. The tray is removable so the hose can be loaded and then the tray is replaced. The unit carries 1,000 feet of five inch hose, 500 feet of three inch hose, 400 feet of 2 1/2 inch hose and 400 feet of 1 3/4 inch hose as a dead load. This 2013 Pierce has an Akron Apollo Deck Gun. The front suspension is an Oshkosh TAK-4 independent, rated at 19,500 pounds. The rear axle is rated at 27,000 pounds. All scene lighting is 12 volt LED and all compartment doors are roll up doors. Ground ladders are carried inside, under the booster tank, and accessed from the rear of the truck. Engine 1710 carries a Genesis Rescue Tool spreader and cutter. Engine 1722 is a 2014 E-One all aluminum HP75 Aerial Quint mounted on a Typhoon Custom Chassis. It is powered by a 2013 450hp Cummings ISL engine with an Allison EVS3000 automatic transmission with a Jake brake. 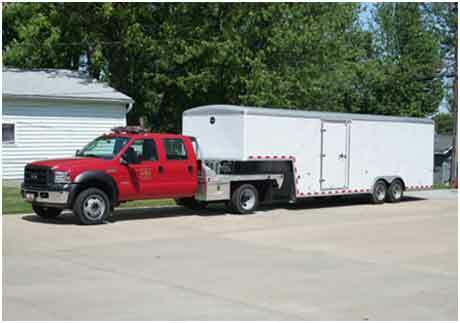 The firefighting package consists of a single-stage Hale 1500 gpm pump supplied by a 400 gallon onboard tank. There are two 200' 1 3/4" pre-connected hoses and one 200' 2 1/2" pre-connected hoses for quick firefighting deployment. The hose bed carries 700' of 5" supply hose and 400' of 3" supply hose. 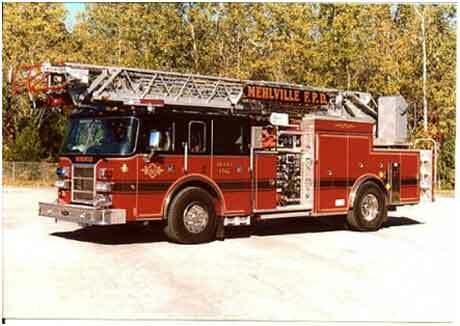 The 75' aerial is operated from a rear mounted turntable and has a pre-piped waterway with a 1500 gpm nozzle. In addition to a standard complement of engine company tools and equipment, a Genesis hydraulic tool with spreaders and cutters are also on board. A full complement of ground ladders is mounted and fully enclosed under the turntable. A Harrison 6KW generator provides all of the truck's electrical needs. 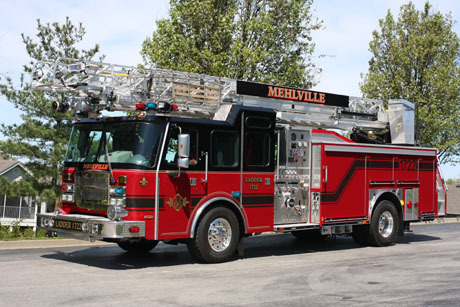 Like all Mehlville engine companies, 1722 carries basic life support emergency medical equipment including an AED (automatic external defibrillator). Engine 1730 is a 2005 Pierce Dash with an aluminum body. It is powered by a Caterpillar C13 12.5 L rated at 430 hp horsepower, Allison 4000 EVS P automatic transmission and has a Jake brake. The firefighting package consists of a single-stage Waterous pump rated at 1250 GPM supplied by a 500 gallon booster tank. There are two pre-connects above the transverse compartment and a booster reel with 260-feet of 1-inch hose. The hosebed carries 1000-feet of 5-inch supply hose, 1000-feet of 3-inch and 100-feet of 1-3/4 inch hose for a skid load. In addition to a standard complement of engine company tools and equipment it carries a Hurst tool with spreaders and cutters. Ground ladders are carried in a hydraulic ladder rack and include a 35-foot extension ladder, a 14-foot roof ladder and 10-foot folding attic ladder. A Harrison 10 kW MCR Hydraulic generator provides 110-volt power for the quartz lights and other electric items. 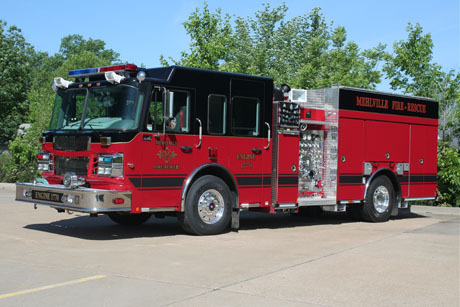 Like all Mehlville engine companies, 1730 carries advanced life support emergency medical equipment including an automatic external defibrillator. 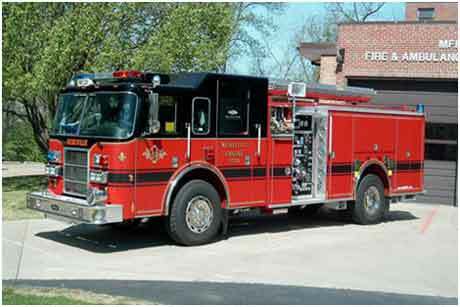 Engine 1742 is a 2001 Pierce Dash quint that is powered by a Detroit Diesel Series 60 motor rated at 500 horsepower and an Allison HD-4060PR automatic transmission with a retarder. The firefighting package consists of a single-stage Waterous pump rated at 1500 GPM supplied by a 400 gallon booster tank. There is a 100-foot pre-connected handline in the front bumper extension, two pre-connects above the transverse compartment and a booster reel with 260-feet of 1-inch hose. The hosebed carries 700-feet of 5-inch supply hose, 750-feet of 3-inch and a 100-feet of 1-3/4 inch hose for a skid load. The 75-foot rear mounted aerial has a prepiped waterway and also has breathing air plumbed to the tip. It can be operated from the turntable or from the pump panel. In addition to a standard complement of engine company tools and equipment, a Hurst tool with spreaders and cutters are also on board. 92-feet of ground ladders are carried in the torque box under the hosebed. A 10 kW Amps hydraulic generator provides 110-volt power for the quartz lights and other electric items. Like all Mehlville engine companies, 1742 carries basic life support emergency medical equipment including an automatic external defibrillator. Engine 1750 is a 2007 Pierce Dash with an aluminum body. It is powered by a Caterpillar C13 12.5 L rated at 430 hp horsepower, Allison 4000 EVS P automatic transmission and has a Jake brake. The firefighting package consists of a single-stage Waterous pump rated at 1250 GPM supplied by a 500 gallon booster tank. There are two pre-connects above the transverse compartment and a booster reel with 260-feet of 1-inch hose. The hosebed carries 1000-feet of 5-inch supply hose, 1000-feet of 3-inch and 100-feet of 1-3/4 inch hose for a skid load. In addition to a standard complement of engine company tools and equipment it carries a Hurst tool with spreaders and cutters. Ground ladders are carried in a hydraulic ladder rack and include a 35-foot extension ladder, a 14-foot roof ladder and 10-foot folding attic ladder. A Harrison 10 kW MCR Hydraulic generator provides 110-volt power for the quartz lights and other electric items. 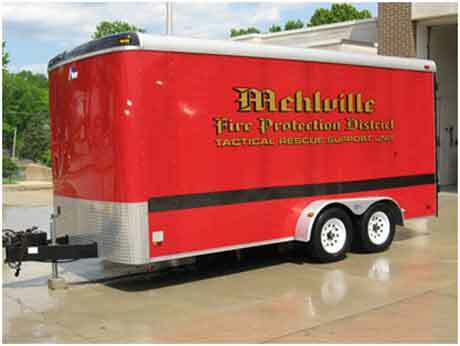 Like all Mehlville engine companies, 1750 carries advanced life support emergency medical equipment including an automatic external defibrillator. Platform 1752 is a 2002 Pierce Dash quint that is powered by a Detroit Diesel Series 60 motor rated at 500 horsepower and an Allison HD-4060PR automatic transmission with a retarder. The firefighting package consists of a single-stage Waterous pump rated at 2000 GPM supplied by a 300 gallon booster tank. There are two pre-connects above the transverse compartment, one with 200-feet of 1-3/4" and one with 200-feet of 2-1/2". The hosebed carries 1000-feet of 5-inch supply hose. The 100-foot rear mounted aerial platform has a pre-piped waterway and also has breathing air plumbed to the tip. In addition to a standard complement of tools and equipment, 112-feet of ground ladders are carried. A 10 kW Amps hydraulic generator provides 110-volt power for the quartz lights and other electric items. 1752 also carries basic life support emergency medical equipment including an automatic external defibrillator. Rescue Squad 1756 is a 2011 Pierce Velocity. It is powered by a Cummins ISL motor rated at 425 horsepower with an Allison 3000 EVS automatic transmission. This unit was an add-on to an order Pierce built for the United States Navy. It features an oversized rear cab that is set up as a command module for large-extended incidents. Rescue 1756 carries a vast array of specialized tools and equipment used in unique rescue situations including two complete sets of Genesis hydraulic extrication equipment. It has a 12,000 pound winch in the front bumper extension as well as a 9000 pound portable winch that can be placed in any of the receivers on the sides and rear of the unit. For the purpose of refilling SCBA cylinders on emergency scenes it has an 8-bottle 6000 psi air cascade. The air cascade also supplies two hose reels, one high pressure and one low pressure, for air tools. An Onan 30kW PTO-driven generator provides power to a Will-Burt Night Scan 15-foot light tower with six 1500-watt lights. 1756 also carries advance life support emergency medical equipment including an automatic external defibrillator. 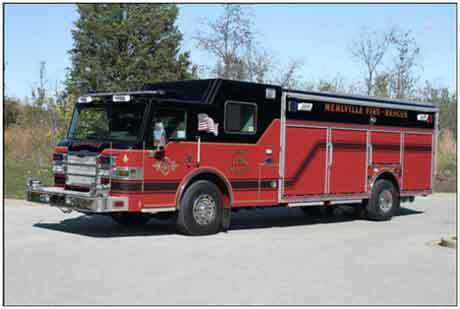 Heavy Rescue 1756 responds to all structure fires, vehicle extrications and other hazardous responses in the Mehlville Fire District and is available for any heavy rescue situation in the St. Louis Metropolitan Area. 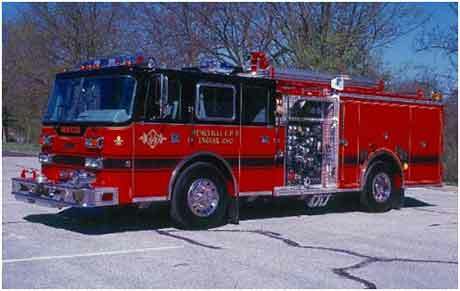 Engine 1760 is a 1997 Pierce Arrow that is powered by a Detroit Diesel 6V92TA motor rated at 350 horsepower and an Allison HD-4060PR automatic transmission with a retarder. The firefighting package consists of a single-stage Waterous pump rated at 1250 GPM supplied by a 500 gallon booster tank. There is a 100-foot pre-connected handline in the front bumper extension, two pre-connects above the transverse compartment and a booster reel with 260-feet of 1-inch hose. The hosebed carries 1000-feet of 5-inch supply hose, 1000-feet of 3-inch, 100-feet of 1-3/4 inch hose for a skid load and 200-feet of pre-connected 2-1/2-inch for a blitz line. In addition to a standard complement of engine company tools and equipment, a Hurst tool with spreaders and cutters are also on board. Ground ladders are carried in a hydraulic ladder rack and include a 30-foot extension ladder, a 14-foot roof ladder and 10-foot folding attic ladder. An 8 kW diesel generator provides 110-volt power for the quartz lights and other electric items. Like all Mehlville engine companies, 1760 carries basic life support emergency medical equipment including an automatic external defibrillator. 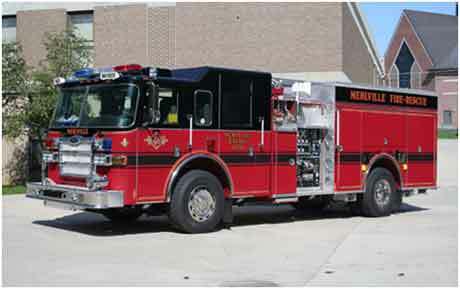 Engine 1770 is a 2009 Smeal/Spartan Four Door Gladiator Chassis. The unit is powered by a Cummins ISM 450 Engine with a Jake Brake. 1770 has an Allison Gen IV-E Model EVS-4000 transmission. Water is supplied by a Waterous 1250 single stage midship pump. This pumper has a 500 gallon booster tank. The Smeal/Spartan has a Feecon APH around the pump foam system and carries 45 gallons of foam in a tank. The unit has an Akron Apollo deck gun on top. The extended front bumper has a front jiffy with 150 foot of 1 3/4 inch hose. The booster reel has 260 feet of 1 inch hose. The unit carries 1,000 feet of 5 inch hose and 500 feet of 3 inch hose with a water monitor attached. The hose bed carries 400 feet of 2 1/2 inch hose with nozzle and 400 feet of 1 3/4 inch hose as a dead load. There are two jiffys above the transverse compartment that have 200 feet of 1 3/4 inch hose each. 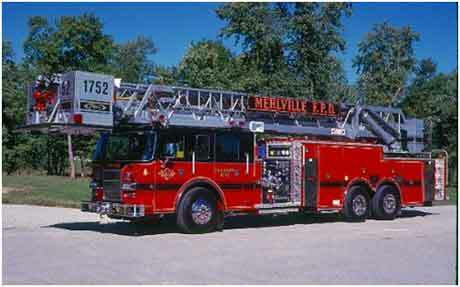 The hydraulic ladder rack carries a 30 foot three section duo-safety ladder and a 14 foot duo safety roof ladder. 1770 Pumper has a 10 kw Harrison hydraulic generator. This supplies power to two 750 watt brow lights, two 1,500 watt side scene lights and one 500 watt rear scene light. 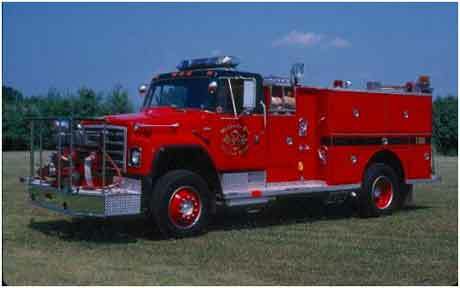 Engine 1778 is a 1981 International S-Model four-wheel-drive with firefighting body with 3D. It is powered by a International DT-466 Diesel motor rated at 210 horsepower with an Allison MT-series automatic transmission. The firefighting package consists of a front mounted single-stage Hale pump rated at 1000 GPM supplied by a 500 gallon booster tank. There is a 100-foot pre-connected handline in the front bumper extension, two pre-connects above the transverse compartment and a booster reel with 200-feet of 3/4-inch hose mounted in the rear under the hosebed. The hosebed carries 1000-feet of 3-inch hose, a 1500 gallon portable tank, two sections of 4-1/2-inch non-collapsible suction hose and 150 gallons of foam in pails. 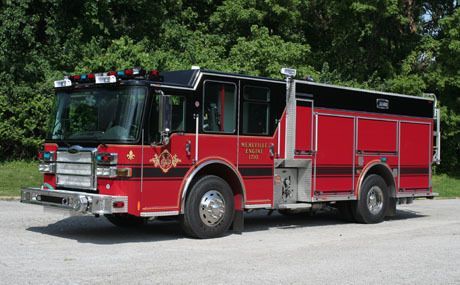 In addition to a standard complement of engine company equipment, 1778 carries items for use in off-road applications and is equipped with a winch at the backstep area.